I don’t often find myself writing about new Alarm apps here on MobileCrunch, primarily because there are roughly 9 billion of them. This one is too clever to not mention, though. There’s nothing quite like waking up in the morning 20 minutes before you’ve gotta be at work, only to walk outside and find your car buried in a 2 feet of snow. Actually, I have no idea what that’s like – I’ve lived in California all my life, where the worst thing I have to worry about is whether or not my steering wheel is going to be hot when I get in the car. But I presume finding your car stuck in the snow is pretty terrible. 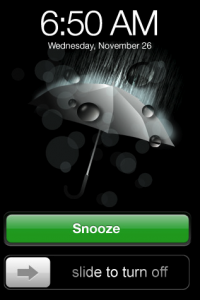 Smart Alarm adjusts your wake up schedule for this, along with other unfortunate bouts of weather. You set the time that you’d like to wake up at, and it starts polling the local weather services. If it finds that you’re about to get shafted by a barometric shift, it’ll wake you up early to try to compensate. The app is $1.99 in the App Store, which is a whole lot cheaper than getting fired for being late 5 times in one week.